I got quite a bit of use out of this sampler, but I am now selling as I am low on funds. This is great for sampling other keyboard instruments and storing the sound you capture on either CD or floppy disk. It’s also great for sampling from CD’s if sampling other peoples music for beats is your thing. If you are looking to downsize your keyboard collection this is a worthwhile investment as it will let you archive your favorite electric piano sounds or synthesizer patches to be recalled at a later date. It’s also great for capturing one off percussive sounds to lower or raise the pitch. I had fun playing around with the tone from a wine glass. biete hier ein CD 3000 der Marke Akai an. Mit dabei ist ein SCSI Imoga Laufwerk inkl.Anschlußkabel sowie eine Bedienungsanleitung und das Netzkabel. Ich biete es ausdrücklich als defekt an ,da ich keine Möglichkeit habe es zu testen. Der Zustand ist dem Alter entsprechend -Einbauspuren sowie eine schwache Displaybeleuchtung. Das Gerät stammt aus aus einer Studioauflösung und hat bis zuletzt einwandfrei gearbeitet. Die Sounds wurden seit Jahren über SCSI von einem ZIP-Drive geladen. Die Funktion der Laufwerke konnte nicht geprüft werden. Es sind keinerlei Disketten, AKAI-CDs und auch kein Netzkabel vorhanden. 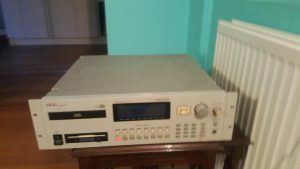 Es handelt sich hier um das Model CD3000/i (s. Foto), welches außerdem mit der Sample-Einheit KIT-CD3000 aufgerüstet wurde. The set comes with manual but without floppy-disks, compact-disks and powerchord. “Akai Sampler CD3000, der Studiostandard in den 90ern, in sehr gutem Zustand aus Nichtraucherstudio, selten in Gebrauch gewesen. Ein paar unwesentliche Kratzer an den Rackösen, ansonsten optisch und technisch fast wie neu. Dazu gibt es eine Deutsche Bedienungsanleitung, Netzkabel und ein Stapel Sample-CD’s. The screen is very bright and clear. the case has the usual rack rash and is worn. This unit has scsi port fitted and comes with On board FX unit as well!! ” Great condition oldschool bit of kit, were very expensive back in the day. 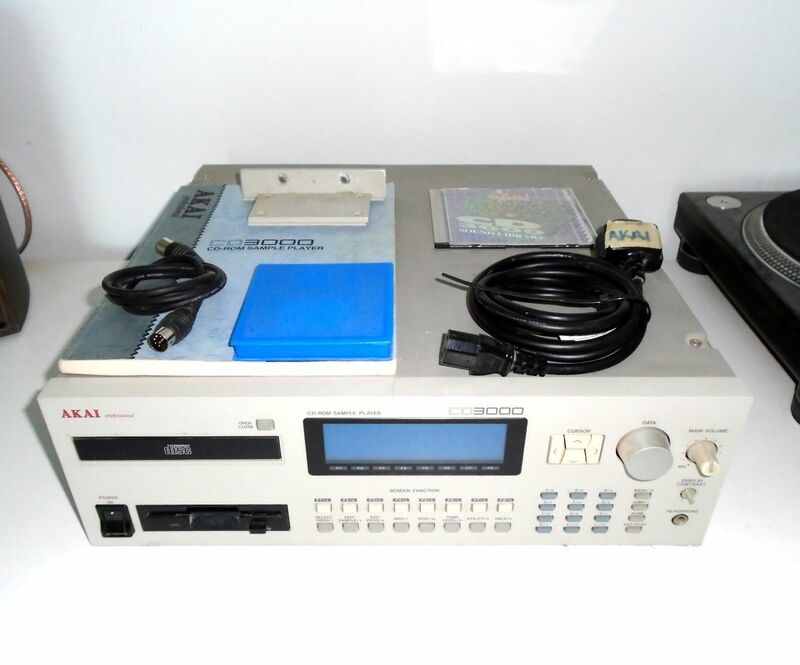 “Akai Professional CD 3000 MIDI sampler. This is the CD 3000 version with analog inputs! Record samples from the inputs or load in from SCSI or floppy. I do not have an Akai formatted CD to test cd-rom drive. For that reason I cannot guarantee operation of the cd-rom. The Toshiba XM-5401B is a direct replacement cd drive for these if it doesn’t work. I’m including a digital copy of the S3000 manual that will work with this. Though there are some differences its a good manual to learn how to run and operate the machine. I’m also including some samples and some software applications to convert floppies into the Akai format. 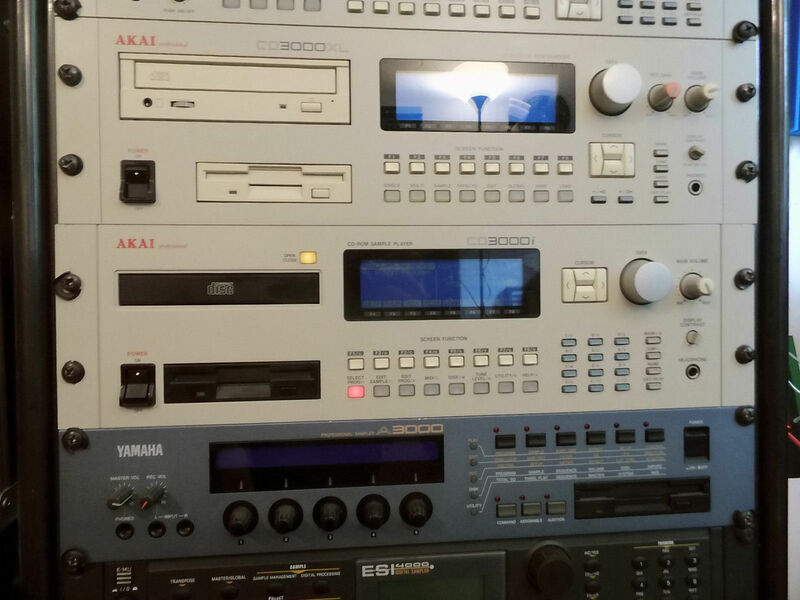 Floppy disks and CDs must be in the Akai format for this machine to read them. I’m including more than one software package for this purpose. Demo sounds are loaded into memory to test and use immediately. By recording samples from the analog inputs you can make your own sounds right away. It has several marks and scratches on it that do not affect the operation, there is also a dent in the rear. She’s not as pretty as used to be but she works great!